If you’re been researching the topic of retiring or buying a property abroad, you’ve seen a lot about beaches, sun, sand, and warm-weather locations. But I routinely hear from readers who don’t like hot weather or humidity and have no desire to live near the beach. Just this week, I heard from two people asking for more articles on destinations with cooler climates. The term “eternal spring-like weather” is abused frequently by those of us who write about overseas living… and I have been among the offenders. The problem is that “spring-like” is different for everyone. Springtime in Alabama is quite different from that of Ontario, for example. I’ve seen lots of people who were too cold in Cuenca, Ecuador, while others are too hot in Medellín, Colombia, yet both places are said to have “spring-like” weather. To me—and in today’s essay—“spring-like” weather is that which stays in the lower- to mid-70s (26°C or less) all year. Here are three of my favorite locations that fit that definition. When I first saw El Retiro, I loved it immediately. The network of narrow streets, its wealth of colonial homes, and the bustling and energetic town square make for a welcoming and inviting setting. What’s more, the town is surrounded by mountains that provide a beautiful backdrop to its colonial ambiance. 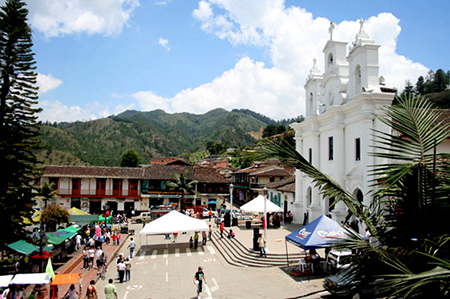 El Retiro is a small colonial city in the highlands just a short distance southeast of Medellín. It’s also a pleasant, 30-minute drive southwest from the José María Córdova International Airport… the airport that serves Medellín. Founded in 1790, the current population is less than 20,000 people. I first discovered El Retiro on a trip from the airport to my home in Medellín when the driver suggested a short side trip. He knew El Retiro well because his family comes here from Medellín frequently on weekends to enjoy the small-town ambiance and cool weather. The colonial center is anchored by a large and stately white church that overlooks the town plaza. 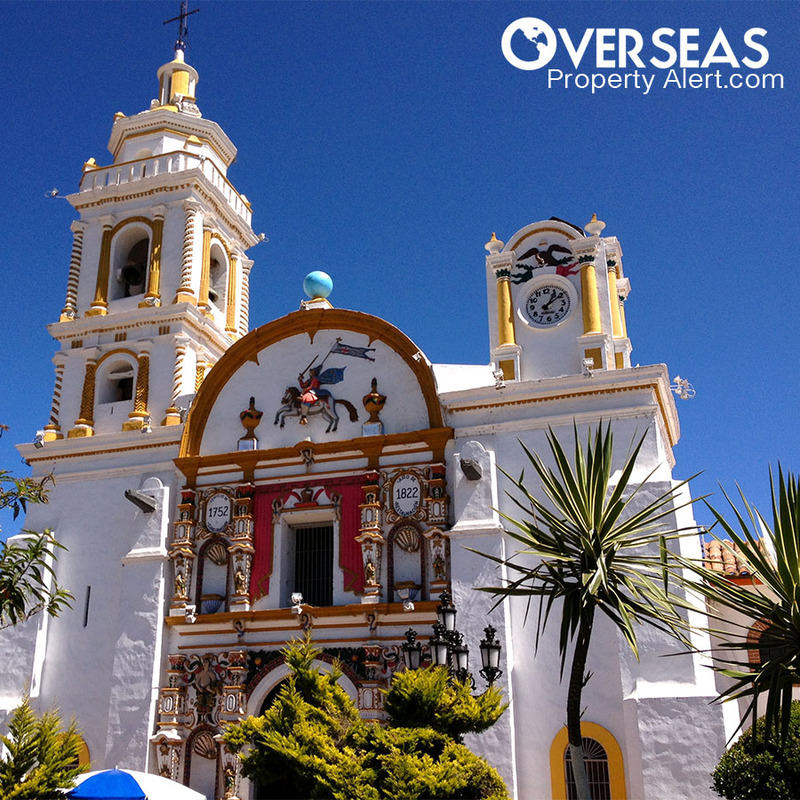 Called Iglesia Nuestra Señora del Rosario, it was actually named for a painting of the same name. And the plaza is definitely the social hub of the historic center… it’s bustling and cheerful all the time. El Retiro is somewhat sleepy during the week, but its cafés and restaurants come to life on the weekends as people from Medellín—many of whom have second homes in the area—come to enjoy its charms. The constant flow of visitors and the number of new projects going up in the area bode well for anyone who is considering buying here. Another good sign is that the government, in response to the town’s popularity, is investing in parks, recreation, and infrastructure. Things like upgrading the riverside park with picnic tables, adding a new bus stop plaza, street lighting, sidewalks, and a new entertainment plaza have recently been completed. El Retiro is perched at an altitude of just over 7,000 feet (2,175 meters). The average high temperature is 72°F (22°C) with a seasonal variation of about one degree. Overnight lows average 55°F (13°C). This should qualify easily as very comfortable weather. – In the center of El Retiro I found a nicely finished second floor apartment for sale. With 110 square meters of living space (1,183 square feet), it has three bedrooms, three bathrooms and is less than two years old. This property is perfectly located for car-free living in the heart of town with shops, cafés, and the central plaza all within a short walk. It would also be a great rental, accommodating weekenders visiting the cool mountains from Medellín. The asking price is US$83,200 at today’s exchange rates (250 million Colombian pesos). These next two are for those who prefer country living outside of town. – A country home in the tranquil hills outside of town has expansive views of the surrounding lush mountains. The main house has 197 square meters of living space (2,119 square feet) with three bedrooms, each with its own bathroom. There’s also a half bath and a spacious open living/dining area surrounded by generous windows and a fireplace. A guest or caretaker’s house has 80 square meters of living area, including three bedrooms and a single bathroom. The finca also has a water reservoir and shop. The asking price is US$233,000 (700 million Colombian pesos). – This finca’s American owner made many stylish upgrades, completely remodeling it to American standards 10 years ago. It comes with marble and granite countertops, a fireplace that is ideal for those cool mountain evenings, and handmade Colombian leather furniture. There is a creek right in your backyard that brings tranquility and relaxing days. In addition, you’ll find a nice sized guest house complete with two bedrooms, two bathrooms, and a complete kitchen. The two dwellings together provide 283 square meters of living area (3,045 square feet) with five bedrooms and five bathrooms. 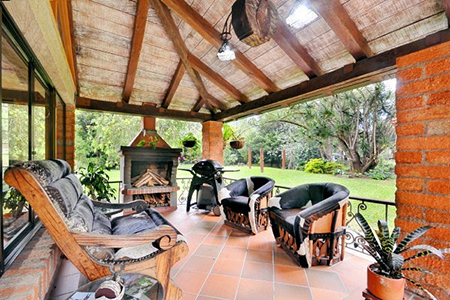 The property is offered furnished for US$298,900 (895 million Colombian pesos). Mortgage financing is available. This is my favorite city in Mexico, even though it’s not well-known on the retire-overseas circuit… actually, it’s probably my favorite because it’s not well-known on the retire-overseas circuit. Puebla is one of the most impressive Spanish-colonial environments you’ll find in the Americas, remarkable because it’s a real city… not one that caters mostly to tourism or expats. It’s a town of around 2.5 million people that still manages to feel like a small community in many ways. Among international travelers, Puebla is noted for its famous Talavera pottery, as well as for its mole poblano… a thick, dark sauce made from toasted ground chili peppers, spices, chocolate, and about 25 other ingredients. 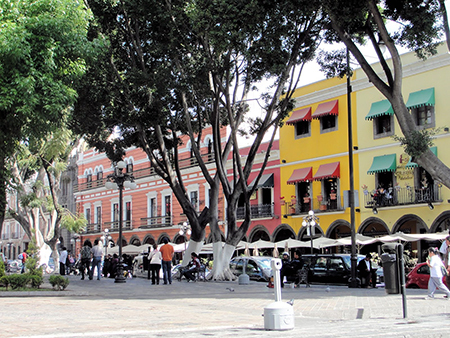 The zócalo (town square) is one of the best in Mexico, an entire city block lined with sidewalk cafés and shops hidden behind the classic portales (arches) common to the squares of many colonial cities. The sheer size of Puebla’s historic center—and its state of preservation—make it unusual in Spanish America and led to Puebla’s designation as a UNESCO World Heritage Site in 1987. There are over 1,000 colonial buildings downtown. The cathedral is magnificent, and you’ll find over 70 other beautiful churches in the historic center alone. There are few American retirees in Puebla. And in fact, if it weren’t for family connections, I may not have made it here myself. This lack of a large American or Canadian expat community will be a positive for some and a negative for others… but it does create the feeling that you’re in traditional, old Mexico. Also, Puebla is easy to get to, with its own international airport. As to the climate, Puebla sits at an altitude of about 7,000 feet (2,135 meters). The average high temperature is 77°F (25°C), with a seasonal variation of about ±5°F. Overnight lows average 49°F (9.5°C). This will pass as temperate for most of us. The prices here are surprisingly low, even near the zócalo and cathedral. This is partly because homes are priced in pesos—unlike the better-known tourist and expat haunts—which gives dollar holders a tremendous advantage at today’s exchange rates. – A brand-new home here has 201 square meters of living space (2,163 square feet) including three bedrooms, three and one half bathrooms, a double carport, a maid’s quarters, and a rooftop terrace. The asking price is US$90,800 at today’s exchange rate (1.7 million Mexican pesos). This is only US$452 per square meter. These next two properties are in projects that took a giant colonial home, and without violating its architectural style, concealed a number of modern condos inside. 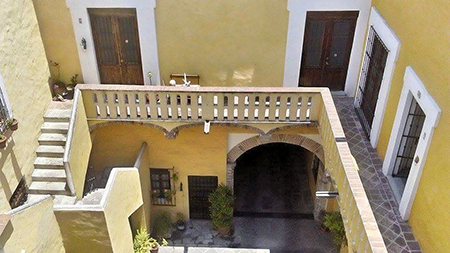 – A genuine 16th century casa antigua, certified as an historic monument and located in Puebla’s Historic Center, has been completely restored and divided into 12 condos. One of these condos is available for purchase. It has 196 square meters of living space (2,108 square feet) arranged on two levels including three bedrooms, two and a half bathrooms, and covered parking for one vehicle. The asking price is US$158,200 (almost 3 million Mexican pesos). – Another opportunity in a casa antigua in El Centro is nearing completion. There are 10 luxury apartments, each with 150 square meters (1,614 square feet) of living area including a Spanish-style kitchen, three bedrooms, two and a half bathrooms, balcony, laundry area and parking for two cars. The common areas include elevators, a roof garden with views of the surrounding mountains and historic center, multiple use salon, storage spaces, and a hot tub. Prices start at US$192,300 (3.6 million Mexican pesos). Arequipa is Peru’s second largest city and third largest tourist destination. Due to its beautifully restored and maintained historic center, it was named a UNESCO World Heritage Site in 2000. It’s known as the Ciudad Blanca, or “white city,” because many of the buildings are built using sillar, a white stone block made from volcanic rock found in the area. The effect of all this white is a sense of brilliance in the strong Andean sun. The architecture has a strong Moorish influence. Construction quality is good here compared to what I’ve seen in other colonial cities due to the use of sillarfor older buildings (instead of adobe, which is made from earth, and used in the newer buildings), in order to withstand earthquakes. Arequipa has a nearby airport, but for most trips, you’ll need to connect through Lima to get here. 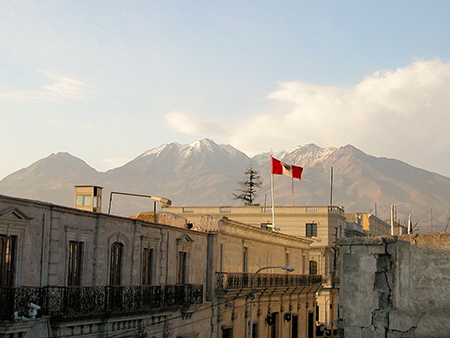 As to the spring-like rating, Arequipa sits at an altitude of 7,600 feet (2,300 meters). The average daily high temperature is about 71°F, while the average low is around 44°F (that’s 22°C and 7°C, respectively) with almost no seasonal variation. For a real estate buy, I like most areas in the historic center… although I’d avoid the blocks immediately around the main square due to the heavy tourist traffic. There are also a number of good residential areas outside the historic center, such as the Cayma district. – Fronting an attractive city park, I found a 179-square-meter (1,926-square-foot), first-floor apartment for sale with three bedrooms, two-and-a-half baths, study, family room, spacious kitchen, and a single garage space. The building is conveniently located close to colleges, universities, and commercial centers. The asking price is US$145,000 at today’s exchange rates (487,200 Peruvian soles). – A modern house built in the old Peruvian style, this one has charming stone arches and counters with tropical-hardwood finishing throughout. The two-level house has three bedrooms and three bathrooms in an area of 220 square meters (2,367 square feet)… 300 square meters (3,228 square feet) counting the carport and interior courtyard. The asking price is US$285,000 (957,600 Peruvian soles). A second home by the beach is enticing to many people… but certainly not to everyone. If you’d rather have cool weather—without the need for heat or air conditioning—then these three options will be worth your attention. For countries with an investment-for-residency visa, is it a one-time investment? If a periodic re-investment is required, will a home purchase satisfy the requirements? If you leave after, say, five years, is the investment returned? Good questions. Investor visas take a number of different forms, depending on the country. Generally speaking, you do have to maintain a qualifying investment to maintain the investor’s visa. In the case of home ownership, this means that you still own the property, or own another one of sufficient value to qualify. If you’re holding a certificate of deposit, you’ll need to show that you still have one of the proper value. That said, in some countries, after holding the visa for a specified period of time, you may be eligible for some form of permanent residency, which does not require periodic re-qualification. I am currently single and would like to live on the coast somewhere in Mexico. I would prefer to buy a beachfront condo rather than rent. I hear from Mexican friends that if the seller knows you are an American, the price will go up. Should I try to buy through a Mexican friend and then somehow transfer the title? It’s true that you may be a victim of “gringo pricing” as an American or Canadian buyer. But the truth is that it’s actually rich-people pricing… that is, a rich Mexican would most likely get the same price as you would. You definitely do not want to have a friend buy the property and then transfer it to you. There would be a large transaction cost in doing this—including the setup of a trust—and it would probably cost you more than it would save… plus, it’s risky. One trick that I’ve used is to have a friend (or a native speaker) establish the price for you, after which you’d take over and sign the actual documents. That may get you a better price, and there’s no risk or extra cost. In Brazil I once gave a hotel receptionist the equivalent of US$20 to respond to about a dozen real estate ads in the paper. I figured that when they heard my accent the price might go up. I’m not sure I got the best prices… but I knew it wasn’t my accent that did me in. This one was directed to contributor John Clites. Your article on Domingos Martins mentioned its German roots and heritage, but did not mention if German is still spoken there. Can one get by there speaking German, or is Portuguese an absolute necessity? You would really need basic Portuguese to manage in Domingos Martins. Although there are efforts to expand the number of speakers, only a minority of residents speak German… which in Domingos Martins is an old Pomeranian dialect, not modern German.